00:00:00 – Oliver Stone’s big ad and the podcast comments challenge (read above). 00:10:13 – Show and Tell: Bridget talks about ScarJo, Adonis reviews Vice Principals, Sam discusses The Enigma of Kaspar Hauser, and Jon goes crazy over The Passion of Joan of Arc. 01:14:05 – Feedback: we answer your questions and comments from last week. 01:29:23 – Coming Soon: we talk about which movies we want to see next weekend. My favorite biopic is probably Goodfellas, with Schindler’s List a close second. I definitely need to see these pictures. And also, I’m not against the idea of an episode where Sam just reacts to memes. I don’t really have a favorite biopic. To be honest, I haven’t seen a lot of them; fiction is better then fact, in my opinion. My two favorite biopics are probably A Man For All Seasons and The King’s Speech. I’ve never seen it, but I sure would like to check out Apollo 13. Does that count as a biopic? I don’t know if it counts as a biopic, but it’s definitely worth watching. So I don’t watch a lot of biopics but I would have to say my favorite is The Pursuit of Happyness because it is just amazing. Ok so there were a lot of things that happened in this episode that I would like to address #1 being I was in public while listening to the podcast(my mistake) and I’m pretty sure that a kid in my ENG 104 class thinks that I’m crazy because when Adonis said that Sam did Adonis I died!!!! #2 I live in Iowa and we basically have corn con but we call it the sweet corn festival but all of the things you guys said about corn con is pretty much what happens there. #3 Jon I know you said no one wants to here about the movies you hate but I want an episode dedicated just to that. And #5 HOW THE HECK IS SAM YOUNGER THAN ME!!!!!!!!!!! Like I knew that he was young but HIGH SCHOOL?!?! I just started my first year of college and I’m turning 19 on Thursday!!!! I feel so unaccomplished!! Although I do have moments like Sam where people think that I’m a lot older than I am. And finally ending off my comment. Adonis I am sorry I am normally on your side but these pictures sound hilarious/adorable so #AdonisPoolParty Sorry bud. My favorite biopic is whatever Sam’s favorite is. Jon, you were right that the director of the new Dredd is more of a TV director. His name is Pete Travis, and I believe it’s been announced that he’s not doing Dredd 2, unfortunately. Per Jon’s recommendation, I watched Passion of Joan of Arc on YouTube and was destroyed! This movie is so amazing I watched it again right after and listened to classical music the whole time. I have no life. Jon, I forgot to comment last week, but I too am a Slytherin. Also my favorite biopic would probably be Ghandi. I do really like pursuit of happyness, but I only read the book and I still haven’t seen the movie. Unfortunately I am morally opposed to the biopic genre in general. They are awful and must be done away with. Because you see if Sam thinks that they are good than they must be terrible. 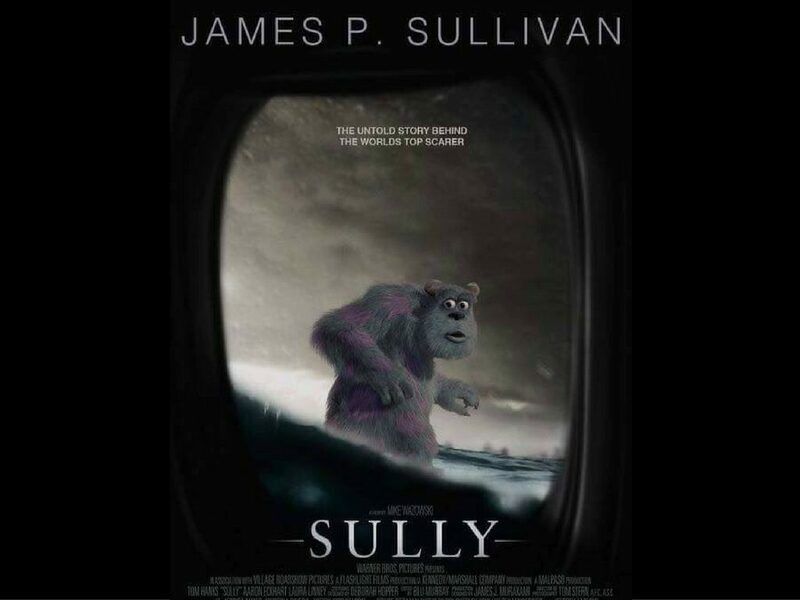 I haven’t seen Sully yet, but I think from what you guys have said its worth checking out, but I’ll probably wait till it is released digitally. I haven’t seen many biopics, but I hope to watch Joan of Arc next week so I’ll let you know my thoughts on the next podcast. You guys that you didn’t read because it was in the same comment as “Irrelevant emoji stuff” here it is: do you think that any of the so far unreleased movies will be better/worse than your picks? I’m a Slytherin, and I don’t have any shame with that. People with ambition change the world, and if they are of good character they can be just as much heroes as someone from any other house. As for best biopic, I’d have to say the french film “Les Intouchables” (2011), where a man from the projects is hired to be the helper of a very rich man who is paralyzed from the neck down. Their friendship is amazing, and both are very funny. Don’t be afraid of checking out a foreign film, this story could have easily taken place in the US. I was, indeed, very passionate about this episode. Im a big fan of Sisterhood of the Traveling Pants. Oh not a biopic you say? Well who’s fault is that?